The menu boasts lists of "Five Wows" and "Impressive Dishes" — and the dishes live up to the claim. The fried glutinous fish balls (left), the eggplant with string beans, and the bowl of fish in pickled cabbage and chili broth were impressive. Normally, when given a menu with over a hundred different choices — as I was at Wojia Hunan Cuisine in Albany — my head starts to spin. But Wojia makes things a bit easier for the indecisive diner by prominently providing a list of "Five Wows" and "Impressive Dishes" at the beginning of the menu. I'm not sure what criteria determine whether a dish falls under the "wow" or the "impressive" category. But the dishes I tried from both lists, as well as my forays into the rest of the menu, were delicious. Wojia opened in July 2018 at the site of a former hotpot restaurant. Though the hotpot tables remain, the restaurant got a modern facelift with a dark-gray interior paint job, faux brick walls, and bright red Chinese lanterns hanging from the ceiling for added accents of color. 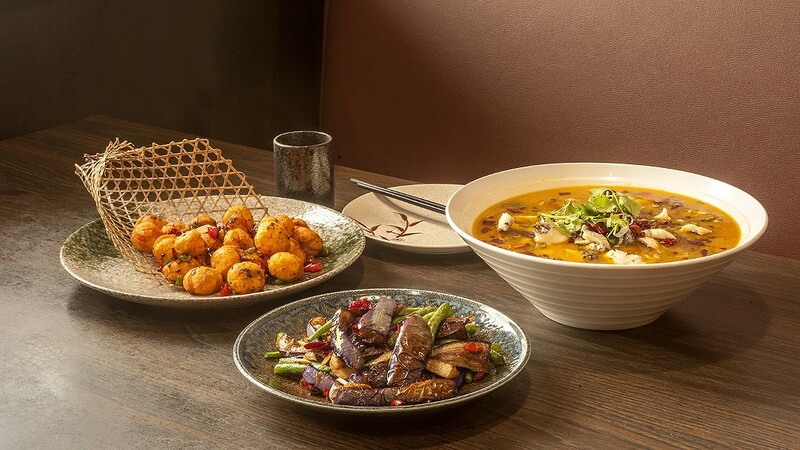 Wojia calls itself a Hunan restaurant, but there are plenty of Sichuan dishes, too. Notably absent, however, are the Chinese-American dishes that many restaurants offer as a concession to pickier palates. The most pedestrian dish I could find here was vegetarian potstickers — and that's a good thing. On my first visit, I started with one of the "impressive" dishes: the fried glutinous rice balls. Each sphere measured nearly an inch in diameter and was made of chewy, slightly sweet rice flour and stuffed with sweet, warm black sesame paste that oozed out upon biting into it. (On a return visit, the glutinous rice balls were stuffed with white sesame rather than black, which lent a more subtle yet equally enjoyable flavor.) The outside was fried to a light crisp, with tiny cracks exposing the soft glutinous rice flour below. But most surprising were the toppings: a mixture of chopped red chili peppers, fried Chinese black beans, slices of garlic, jalapeño peppers, and cilantro. The toppings transformed the flavor of the glutinous rice balls into a sweet, savory, spicy, and chewy delight that was tough to stop eating. I also sampled the toothpick lamb: bite-size pieces of tender lamb cooked with plenty of cumin, each piece speared by a toothpick. Like the glutinous rice balls, this dish was topped with chopped red chilis, slices of garlic, and cilantro — but this time with the addition of crunchy celery for contrast. The chili, along with the cumin, created a fragrant, tingling heat that lingered in my nostrils. Nearly every table seemed to have a bowl of the fish in pickled cabbage and chili broth, so I got one too. This was listed under the "impressive" dishes category, and visually, the dish lived up to its promise. Served in a colossal bowl, the pickled cabbage lent a chartreuse color to the broth, while chopped red chilis and a handful of cilantro brightened the dish's color palette. The dish is available with either "sliced flounder or fresh fish," and I went with the fresh fish option, served sliced with bones and skin intact. The broth was pungent and tangy, with a hint of floral, citrusy, tingling heat from the Sichuan peppercorns that floated on the top. The fresh fish didn't quite seem worth the price, but it had a mild flavor that was complemented by the strong flavor of the broth. In between sips of mouth-puckering cabbage broth, I took a few bites of the green onion pancake. This isn't the thin, crispy, oily version I've come to expect when ordering at other restaurants. The green onion pancake here is really more of a bread — it's over two inches thick, with a light golden crust and a fluffy interior. Salty, sharp green onions were folded into the slightly sweet, airy dough, while sesame seeds studded the outside. The pancake was a little bland, but that's not a bad thing when nearly every other dish is topped with heaping chili peppers and garlic. I expected that the cold chicken noodles with cucumbers would similarly provide respite from the tingly, subtle heat of the other dishes. The dish was impressively presented: The noodles were tidily arranged in a tall pile, surrounded by strips of julienned cucumber and a sprinkling of sesame seeds and cilantro on top. The thin, flat wheat noodles had a delightful al dente texture reminiscent of handmade pasta. The cucumber added crunch, while the sesame, cilantro leaves, and chicken added layers of flavor. But the dish was anything but mild. The noodles were coated in a chili oil that, while undetectable at first, provided a creeping heat. It wasn't overbearingly spicy, but appearances were deceiving in this case. Still, I'd gladly order this dish again. 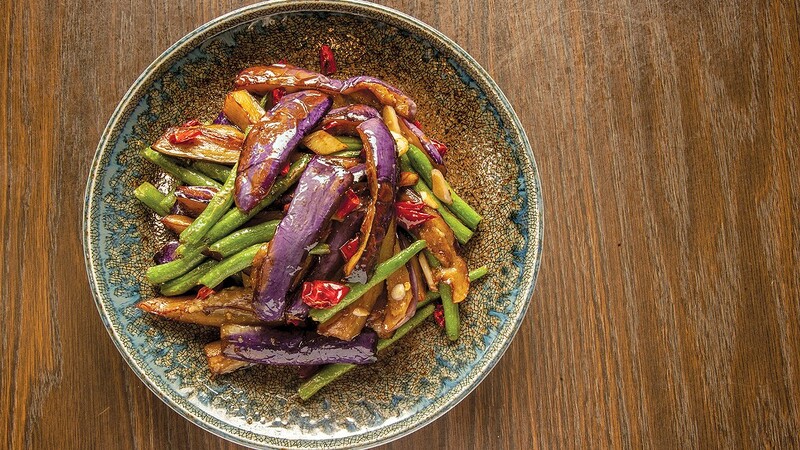 One of the most impressive dishes was one not from the menu's "impressive dishes" category, but from the vegetables: the sautéed eggplant with green beans. Here, strips of eggplant were caramelized to a golden brown on the outside. The inside was cooked to an ideal, custard-like softness with a bit of bite, without absorbing any excess grease. The green beans, on the other hand, provided a satisfying crunch. Like most other dishes I ordered, this one was topped with red chilis and garlic, but the seasoning still allowed the flavor of the vegetables to shine through. The eggplant and green beans were ideal. And at last, I ventured into the "five wows" category with the Chairman Mao stewed pork hock. Of everything I ordered, this dish certainly had the most wow-inducing presentation. At the center of the plate was a whole, bone-in pork hock topped with red chilis and green onions, surrounded by neatly arranged, vibrant green bok choy. The skin was caramelized to a deep reddish brown, and the marbled, fatty pork was so tender that you could cut into it with the provided serving spoon. The sweet, salty, and thick dark brown sauce added additional richness, while the bok choy added contrast and freshness. Best of all, the pork hock clocked in at less than $20, and the portion was big enough for a family of five or six to share. Hours: Sun.-Thurs. 11:00 a.m.-9:30 p.m., Fri.-Sat. 11:00 a.m.-10:00 p.m.